With a number of companies from the manufacturing industry struggling financially at present. Purchasing more warehouse or office space isn’t always possible. They may not realise that one of the best ways to utilise their current space is with racking systems. 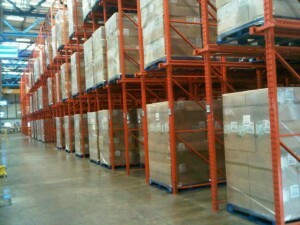 Racking system not only enhance productivity, it can also help with the organisation of a warehouse. This can increase the working area without the expense of extensions or new facilities. At Storage Concepts we are able to provide a wide range of warehouse racking that can interface with any type of forklift and accommodate any pallet size or weight. Our racking systems can allow products to be stored sufficiently. They are accessible from either side. Meaning forklifts or stepladders don’t clog up the aisles. With your stock off the floor and stored upwards, mean you will have a much cleaner and organised environment. With this new organisation, productivity will increase. Along with giving the look of a functional warehouse to any potential or existing clients that may come to site. Pallet racking is a good investment for any business, mainly because there is no end to the amount of options available to you. If you realise you need more racking, you can add more to your existing units. This includes extending upwards and outwards, depending on your spatial restraints. Our team of designers can work with you. we can start with coming to site we can establish what is going to work best for you and your company. We will work with you throughout the project from the initial enquiry to the final installation. Talking you through the options that are available and making sure that you get exactly what you are looking for. So if you’re struggling for space and moving is not an option available to you, get in touch with Storage Concepts by calling 01664 410414 or take a look at our website for more information on pallet racking and how it can benefit your business by clicking here.